Walk away from tedious pipetting tasks without being locked into a predefined workflow. When a lab grows, the demand for automation not only increases, but also changes. By understanding these challenges, we can support you with ‘Swiss quality’ instruments tailored to your specific needs, from sample splitting and aliquoting to archiving and preparation of downstream assays. Our solutions are built to be IVD-D 98/79/EC compliant, helping you to meet regulatory and accreditation requirements. Our experts can help you to make your work flow better and choose the best configuration for your needs. ELISA processing solutions from low to high sample throughput, covering everything from simple testing to the analysis of complete diagnostic assay panels. Our integrated and expandable solutions are targeted towards specific user needs – with open software and verified protocols for the Tecan immunoassay portfolio – and are built to ensure compliance with the IVD 98/79/EC directive. The performance of each immunoassay is individually verified, and offers excellent correlation to manual testing. The portfolio is continuously growing, and covers both diagnostics and research applications. Processing complete diagnostic panels in a single run enhances reproducibility, ensuring greater confidence in results. In this example, 17 different assays are performed across 10 microplates, including predilution, in under five hours. The Freedom EVOlyzer can be configured for high throughput analysis of over 500 samples or mixed processing of up to 20 different assays per run, according to your workflow needs. With optional sample dilution, plate preparation and archiving, the system offers true sample-to-result immunoassay capabilities and beyond. Plate-based immunoassays are robust, but pipetting speed still matters if full 96-well microplates need to be processed. 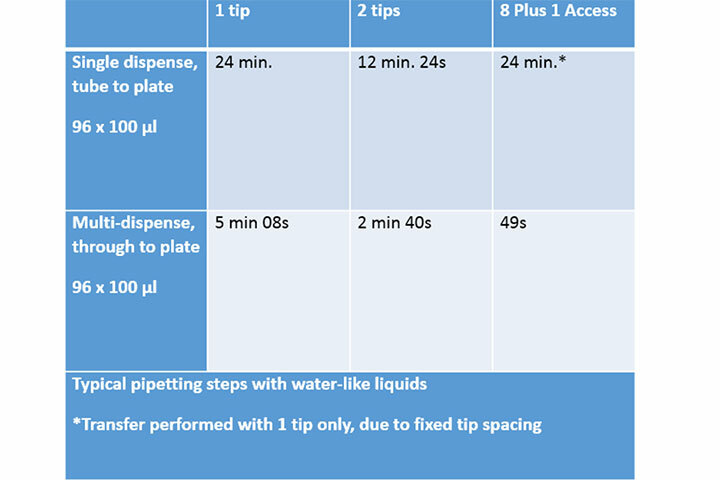 Tecan offers instruments with a choice of two, four or eight pipetting channels, ensuring consistent pipetting and preventing OD drift across a plate. Typical CVs for assays processed on the Freedom EVOlyzer are ≤3.5 %. With up to two independent liquid handling arms, samples and reagents can be pipetted in parallel, eliminating any processing bottlenecks. One arm can pipette the next sample batch while the initial sample set is incubating, using the second liquid handling arm to add reagents. The addition of up to two HydroFlex™ washers further improves throughput. Process security features – such as Pressure Monitored Pipetting (PMP™) and cLLD – improve efficiency and quality by detecting and handling sample processing errors, reducing the number of sample reruns. 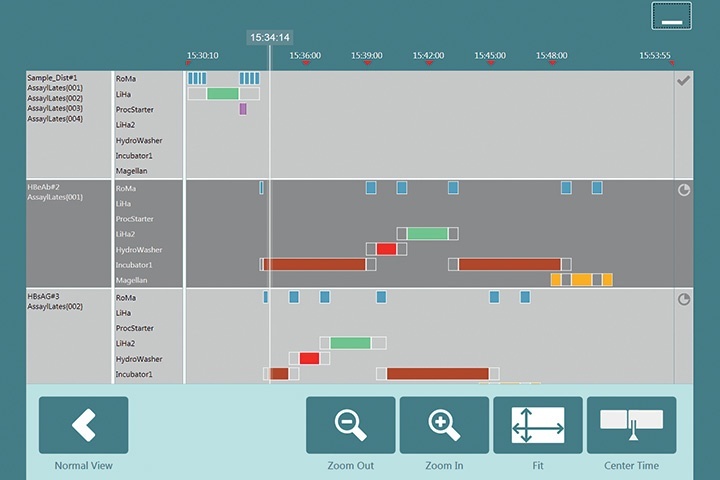 The TouchTools™ graphical interface allows the operator to select the assay or panel to run, then guides them through the loading of samples, reagents and assay plates, as well as the performance of any maintenance steps. The software also provides real-time feedback, showing where each assay plate is in its schedule, helping operators to perform any interventions required. Assays can be grouped into panels that can either be run together in batches, or selectively when a job list is available from the LIMS. The Sample Distribution Wizard and easy-to-use, drag and drop process editor help the user to set up incubations, reagent additions, wash steps and analyses. MLM Medical Labs is taking advantage of the Freedom EVOlyzer workstation’s optimized ELISA processing to help meet the complex laboratory support needs of clinical trials, increasing throughput and improving process security. Vestfold Hospital Trust in Norway has chosen the Freedom EVOlyzer for automation of ELISA assays in its microbiology laboratory in Tonsberg. Automation of nine ELISAbased serological tests for autoimmune and infectious diseases on the Freedom EVOlyzer® platform has saved Unilabs AB, Skövde, Sweden, a lot of labor, releasing valuable time for other activities. An intuitive graphical user interface and an integrated scheduler for multi-plate assays help to maximize throughput and optimize resource use. The software enables you to define all processing steps before, during and after any run, with individual start-up, maintenance and preparation protocols based on your instrument set-up and workflow requirements. 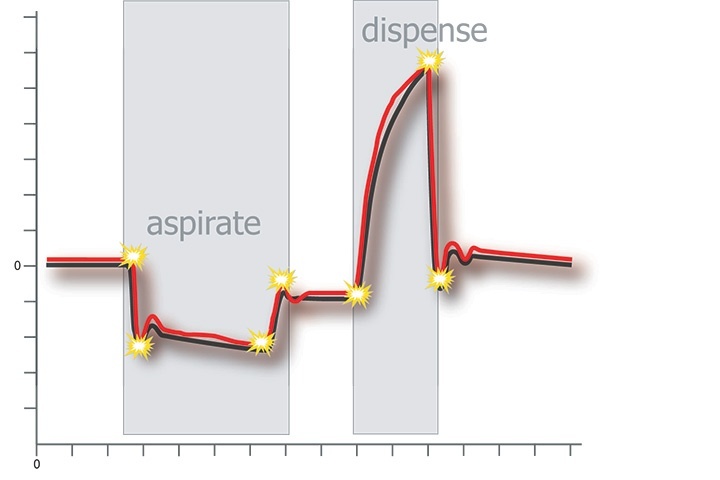 PMP calculates a theoretical pressure curve for each pipetting activity and compares it in real time to the measured curve. If one or more fitting parameters are ‘out of range’, the system flags an error. Extensive error handling options prevent invalid runs and the waste of reagents and consumables. TouchTools intuitive, customizable touchscreen interface makes it easy to program and perform your specific assay protocols. Every aspect of the interface has been designed to simplify interaction, helping to avoid potential errors, optimize instrument uptime and boost productivity. The simplicity of EVO Logic offers straightforward daily operation and gives labs the flexibility to adapt to changing application needs. It covers a range of pre-analytical tasks – from sample distribution and microplate preparation to pooling and sample archiving – for Freedom EVO® platforms. EVO Logic provides LIMS connectivity through a standardized interface, receiving and sending sample-based information in a generic format suited to data exchange with standard clinical equipment. Add integrated scheduling capabilities to the intuitive graphical user interface of Freedom EVOware, ensuring optimal processing of plate-based assays. Freedom EVOlution is Tecan’s software for the Freedom EVOlyzer, a dedicated sample-to-result ELISA instrument that is 98/79/EC IVD. Its unique dynamic scheduling capabilities support simultaneous running of a wide range of assays with different processing conditions. Tecan’s Freedom EVOware Sample Tracking software is being set up as a bridge between the Laboratory Information System and three Freedom EVO instruments for data handling. Tailor your platform for fully automated ELISA processing and more: perform serial dilutions, split samples, reformat plates, prepare plates for downstream testing (eg. chemiluminescence assays) and archive your samples – all in one go. A new generation of dedicated, fully automated immunoassay workstations for high throughput testing. Eliminate processing bottlenecks with up to two independent liquid handling arms and Hydroflex washers. The Infinite 200 PRO caters to the needs of today’s scientists, offering flexible, scaleable detection solutions for a wide range of assays using monochromator- and filter-based technologies. Evaluation of Tecan’s HydroSpeed plate washer and Infinite F50 absorbance reader using a HBs Ag assay as an example of a qualitative, one step ‘sandwich’ type enzyme immunoassay for the detection of hepatitis B viral surface antigen in human serum or plasma. AlphaScreen (Amplified Luminescent Proximity Homogeneous Assay) is a bead-based screening technology developed for fast, reliable and cost-effective detection of biomolecular interactions. It utilizes the energy transfer between donor and acceptor beads that occurs when these are brought into close proximity due to a binding event between their coupling partners. As a result, a strong luminescent signal is generated that can be detected in a wavelength range of 520-620 nm. 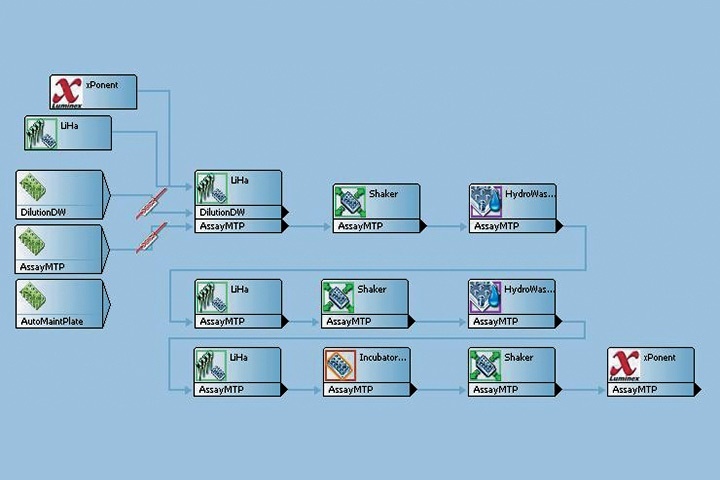 Programming simplicity and operational consistency at your fingertips. Based on Freedom EVOware, this sample-oriented add-on provides an easy to use interface for sample-based pipetting.